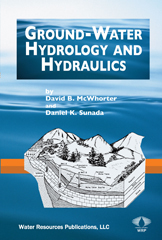 ". . .one of the best textbooks for teaching courses in ground-water hydrology for seniors and first-year graduate students in Agricultural Engineering, Civil Engineering, Geology and Watershed Hydrology." The book is designed for use as a textbook. The emphasis on basic physical and mathematical concepts should be found useful to professional hydrologists and geohydrologists. A solid background in fundamentals and a thorough understanding of groundwater phenomena in idealized cases contributes immeasurably to imaginative and successful analysis, synthesis, and solution of field problems. Presentation of the subject matter begins with an overview of ground-water hydrology with a definition of some basic terms and a limited discussion of the role of geology as a fundamental supporting science. The role of ground-water in the hydrologic cycle is implicit in the material of Chapter II where groundwater storage and water budgets are discussed. Fluid flow through porous media is presented in Chapter III with emphasis on Darcy's Law and its significance. The discussions of steady and unsteady flow in Chapters IV and V emphasize local groundwater problems such as well flow, drainage, mine-inflow, etc.. A chapter on finite difference techniques is included to provide the student with an introduction to methods and tools available for basin-wide or regional analysis. One feature of the book that will be especially useful to the reader is the numerous worked examples and the problem sets at the end of each chapter. Many of the examples and problems are designed to help elucidate principles and several are straightforward applications of the text material, but in contexts that deviate to some degree from the context of the original presentation. This will reduce the tendency of the reader to associate a particular development only with the context in which it was derived.